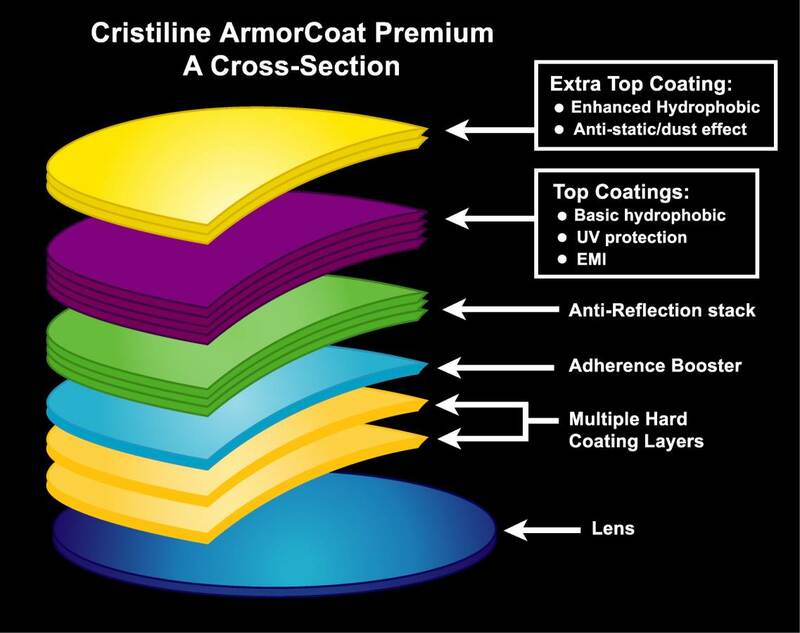 We believe it's very important that you get the best possible lenses in your glasses, which is why all our lenses come with our Cristiline® ArmorCoat Advanced coating package. 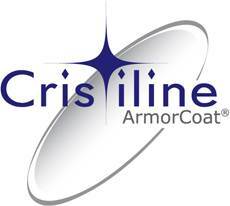 Cristiline® ArmorCoat consists of 5 necessary coatings, and is included in the price of your glasses. Included in this package are the following coatings. There is no such thing as a scratch-proof lens; even glass eventually ends up with scratches. However, every single lens that we deliver is treated with a clear hard coating on both the front and back that makes the lens more resistant to scratches. This way, your glasses don’t get ruined when your cat gets a hold of them or when you drop them on the floor. But remember that an anti-scratch coating doesn’t offer 100% protection against wear and tear, so properly store your glasses in its hard case when you’re not using them, and only clean the lenses with the microfiber cloth provided. 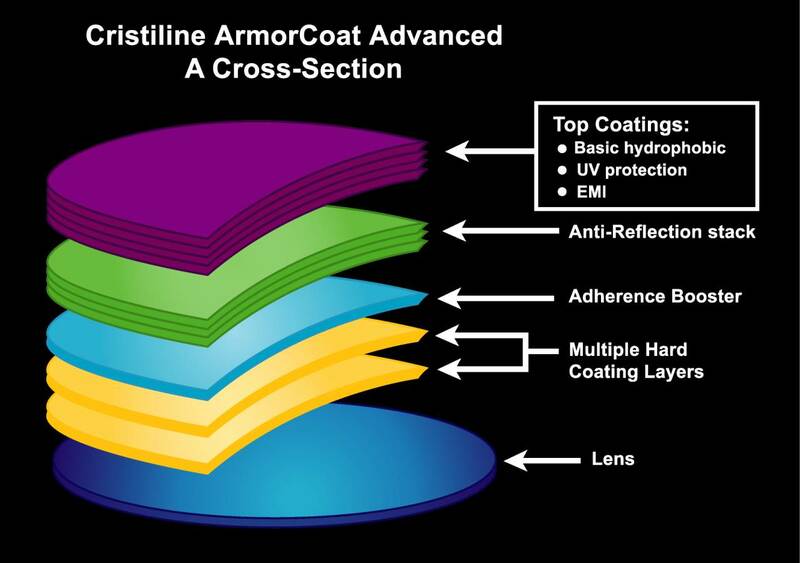 Cristiline® ArmorCoat Advanced: click to enlarge cross-section. Anti-reflection coating helps keep glare at bay, both from the inside and outside of your lenses. The multi-layered metal oxide coating is applied to the front and back of clear lenses to increase the light transmission through the lenses, minimizing that annoying glare people see when looking at you and diminishing the irritating glare sometimes present on the back of your lenses when the light source is behind you. This is ideal for driving at night, because the glare, reflections and halos encountered on the road are greatly reduced. Because of the layering effect, it is very normal for the coating to have a very slight hint of purple or green, depending on the formula used. Adding a hydrophobic layer to lenses makes cleaning smudges and fingerprints off your lenses easy. Because a hydrophobic coating fills in the spaces in between the crystals of the lens, it keeps dirt on the very top surface of the lens. It also acts as a water repellant; water will simply roll off your lens instead of drying onto it. 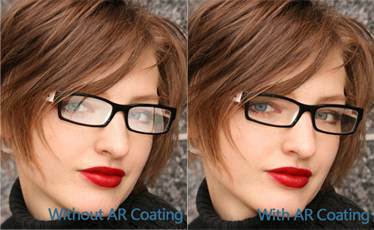 An AR coating gets rid of glare on the inside and outside of your lenses. UV coating offers full protection from harmful UV rays. This is especially beneficial because UV light has been linked to problems like cataracts, loss of color vision and even blindness. Most people already take significant precautions to protect themselves from the sun’s harmful rays by wearing appropriate clothing, sunscreen and hats. But half of the lenses sold worldwide do not have adequate UV protection in them. We’re determined to give every single one of our customers the protection they need for their eyes, which is why we include the invisible UV coating on every single lens we produce, clear and tinted alike. 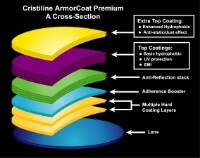 Cristiline® ArmorCoat Premium: click to enlarge cross-section. For a small charge, you can upgrade your Advanced coating to a Premium coating. Cristiline® ArmorCoat Premium includes all aforementioned coatings, but adds an additional super hydrophobic and anti-dust layer. Cleaning your glasses is a breeze with this upgrade; the super hydrophobic will make wiping smudges away a breeze, and makes sure that water does not stick to your lenses. Permanent smudges and spots become a hindrance of the past, because your glasses now clean easier and more thoroughly. Also, keeping your glasses clean for longer is made possible; the anti-dust layer prevents from dust from sticking to your lenses throughout the day. Also, an EMI coating is added on the Cristiline Premium. This helps protect your eyes from the radiation off computer and television screens. This will reduce eye fatigue, especially if you work extensively with a computer. Cristiline® Blue-X are clear lenses with 20-25% protectiion against blue light. Cristiline® Blue-R are lenses with a slight yellow hue with 100% protection against blue light. Click here to learn more about Blue light protection coatings. Driving at night can be an uncomfortable experience for many people. Reflections from other car head and tail lights, traffic lights and street lighting can produce large halo's and blurring of the image. This in turn makes judging distances and traffic situations difficult and can lead to dangerous situations. Many people are less confident when driving at night. Significant research resources have been dedicated to finding a solution which works for prescription glasses. By applying advances in light ray analysis and vacuum coating technologies, an advanced NighDrive Gold coating has been introduced which reduces undesirable reflections at night while maintaining a 99% light transmission through the optical lens. The result is a much improved driving experience which makes the driver with NighDrive Gold lenses much more secure behind the wheel. Click here to learn more about NightDrive. 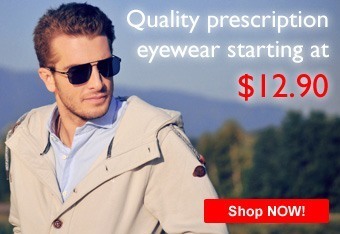 Visio-Rx was founded on the principle that everyone should be able to have a complete pair of glasses at an affordable price. Coatings are a very large part of a complete pair of glasses. Go ahead, give us a try. We won’t disappoint you.